By M. LoParco by Dryden Art School. Today more than ever the arts are needed by our young people as a forum for safe expression, communication, exploration, imagination, and cultural and historical understanding. See how Arts to Grow aligns with this statement. · Brain research confirms that Arts education strengthens student problem-solving and critical thinking skills, adding to overall academic achievement, school success, and preparation for the work world. 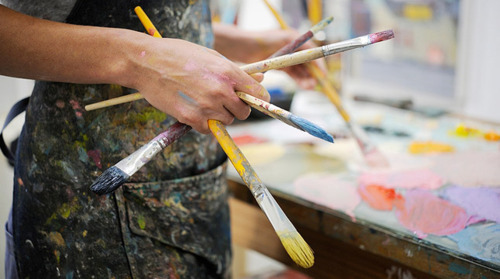 · Art classes provide students a chance to develop cognitive and creative skills, and to develop their imaginations. · For some students Art is their motivation for coming to school and an area where they have success or excel, providing an important balance in their total educational experience. · The arts teach our students to be more tolerant and open through multicultural and historical perspectives and through their involvement in the creative process itself. See Visual Art Class slide show with Arts to Grow. This entry was posted in Uncategorized and tagged artist area, Arts, arts education, arts to grow, Dina's posts on February 22, 2012 by arts2grow. Arts to Grow (ATG) engages children in the artistic process by providing free, highly tailored and professionally taught arts education programs to youth in the New York metro area who have limited access to the arts. Arts to Grow collaborates closely with schools and community groups to match performing and visual arts programs and Teaching Artists with the specific needs of each group of children. ATG serves the community and society by helping children develop their full potential through the arts. Arts to Grow’s New Website is Live!